Barely recovered from the post-Thanksgiving Black Friday mania, I am being asked to step right into Christmas mode. There is no avoiding the ads, the Christmas aisle at the drugstore, the daily mentions of preparations in the paper, and the creeping frenzy that I feel in my surroundings. The new fake tree. It looks so real, you won’t even notice the difference. Some even have a fake smell to imitate the real thing. The stuff will last you for years. Imagine, no more trip to the tree farm every year. No more loading the monster on the top of your car. No more mess of pine needles throughout your house. No more watering. Done, you are set. And why worry about how to dispose of it? By the time you are done with it, it will be years, and hopefully by then, we will have figured out how to dispose of plastics without taxing the Earth too much. Still, there is the environmental cost of producing yet another man made plastic object. The used fake tree. There are tons of those floating around. You are not generating new plastics. This is a very reasonable option. I can’t help but wonder about the life of those trees prior to being recirculated. Did they witness happy Christmases? Who were their prior owners? How come they got ditched? The real tree. If you are like me, and can’t stand the idea of a plastic tree, go ahead, indulge yourself and your family, and don’t change a thing to your tradition. Gather your whole crew into the biggest car you own, and set out to your usual spot. Go to a tree farm to cut down your own, or just visit the nearby lot with already cut trees. It’s so much fun trying to pick the perfect tree, not too crooked, not too tall, not too short. Will it fit? We never made it as far as the tree farm, always went to the same lot close to our house. If you are environmentally correct, this is something to think about. How much gas will you use to drive to the tree farm? The live tree. Forget all that cutting and buying a fake. Instead go to the nursery, and buy a potted tree that you can reuse every year. You can bring it inside for Christmas, otherwise keep it in your yard. Of course, this is not an option for people without a yard. Nothing wrong with that option, that I can think of. Last week’s Black Friday and Buy Nothing Day, inspired me to write, ‘Finding a Sustainable Middle in a Country of Extremes‘. Yesterday was Black Friday. Despite all my good intentions, I ended up joining the crowds at the mall. I have gotten much better at taming my consuming urges, to the point where I do not even feel the desire any more. To refuse my daughter, however, that’s another story altogether. She was so sweet, and I wanted to please her. Off we went, and ended purchasing all three items on her ‘need or rather want’ list. If I still had any remaining doubts on the extent of the challenge facing our society, the sight of all these people, happily walking from store to store, multiple shopping bags in hand, and on a mission to find more bargains, put an end to them. Then, comes Adbusters, and its arresting Buy Nothing Day TV ad with a burping pig, calling for us to put a stop to our consuming frenzy. I did not know about Buy Nothing Day, until a few days ago. Now, it seems everywhere I turn, someone has vowed to not buy anything for a day, a week, and sometimes even as long as a year. You can make it as tough as you like, depending on your own fortitude. The Compact people are gathering momentum, and their two year old Yahoo Group of diehard non-shoppers is going strong with 8,500 members. There is also No Impact Man and his one year experiment. From one extreme, to the other. Either you can shop till you drop dead, or you are to stop shopping, cold turkey. In both cases, I dare question the sustainability of such extreme behaviors. It is now an established realization, that we cannot keep on consuming the way we do, without jeopardizing life as we know it on this planet. What concerns me, . . .
Third day of Daily Footprint Project. 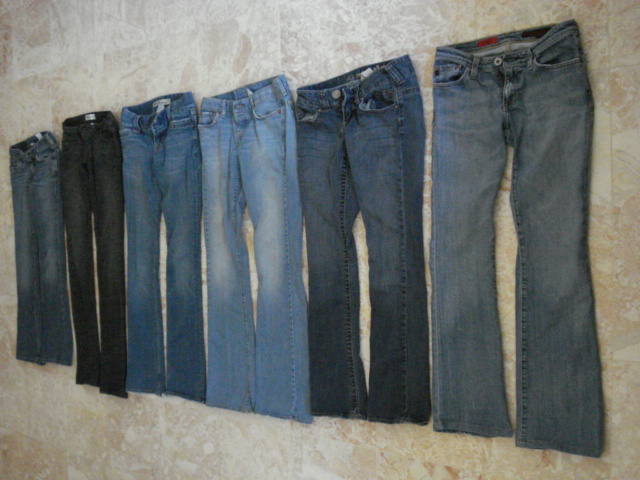 Six pairs of jeans. I counted. Fresh out of the dryer. Part of my sixteen year old daughter’s biweekly laundry. I took her laundry out of the wash earlier, and put it in the dryer. I did that as a favor to her, and also because I needed the wash machine to do my own laundry. That’s when I realized. With my awareness more turned on than usual, I started counting the jeans. Six. I make do with one jean a week. A big part of my footprint is related to my green softness as a mom. It is hard enough navigating the treacherous path of teen parenting, without introducing some more restrictions. If I was going to be pure green, I would hassle my daughter about so many things. Turning off the lights. Limiting her laundry. Using the Energy Preferred setting for the dryer. Even better, not using the dryer at all, and start using the drying rack more. Not driving to her school, that is only half a mile away. Not dumping recyclable plastics into the garbage. Turning off her computer. Unplugging her appliances. Eating leftovers. It’s not that I don’t tell her. I just don’t follow through with the kind of consequences and incentives that might make her take me seriously. Call me weak, but I don’t have it in me, right now. I am fighting other battles, and I am not about to take on one more. If my children were little, that would be another story. The best I can offer, is to inspire her through my example, the small changes I am making every day. ‘Mom, can we heat the hot tub? My friends are coming over.‘ I said yes at once. And then, almost in the same breath, this whole monologue in my head. ‘Not exactly green. Big time indulgence. Didn’t I go through all those carbon calculators this morning? But then I want to please her, there is no way I am going to say no. I am tired of setting limits. Tonight, I want to be Nice Mommy. The hell with global warming. Plus a couple hours of hot tub are not going to make a difference.’ I can hear Green Guru’s admonitions, ‘You are being a hypocrite. You are all talk. You say you want to be green, but look at you, you can’t say no to her.’ I hear, I know, and there is no way I am not going to be sweet. I bask in the moment. The sound of four girls laughing, talking, in the hot tub. Green Guru got on my case for something else. I have the habit of always buying more than we need. The peaches have been rotting in the fruit basket. His point was, why not buy less each time, especially since I am shopping at Whole Foods nearly every day? That makes sense. Still, I have a hard time agreeing with him. The fear of not having enough, of not doing my job as a mommy and main nurturer for the whole family, is greater than reason. Charlotte came back from her one week vacation in Mexico with her dad. I was so happy to see her. She suggested we go to Urban Outfitters to shop. That was perfect, I needed to go there anyway to buy Ahna’s birthday present. While at the mall, we also decided to swing by Anthropologie. I was so good, I did not buy anything for myself. The truth is, I am shopped out, and there was really nothing I wanted in either place. Had I been tempted, I would have probably given in. On our way back, I thought about how far Santana Row is from Palo Alto, and how much gas we used driving both ways. Could we have found the same things closer? Probably not. Were our purchases essential? Definitely not. If I was a true green girl, at a minimum, I would have suggested to Charlotte that we take the train to the Urban Outfitters store in San Francisco. Better even, I could have suggested other ways to spend time together, or other more environmentally sound places to shop like vintage stores. Same with Ahna, I could have asked her to think more creatively about things to get for her birthday. As a mother, I hate to spoil the fun with my green ideas. It is a territory I do not feel comfortable exploring yet. Shopping (at the mall) with, and for my children, is such a part of who I am as a mother. The one good thing about Paris, is the transportation. We are learning to rely on our feet again, to go from place to place. In two days we have walked, taken the subway, the bus, and the Batobus on the Seine. No car, with the exception of my brother giving us a ride from the airport. We are eating so much, and still, we are losing weight from all the exercise. I wish California was not so dependent on cars. The people would be healthier, and the air would a lot more pure.